Where is our Library located and when is it open? 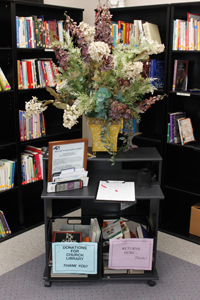 The St John's Lending Library is located in Room 205 (next to the choir room) and is open whenever the church building is open. Come in, select something to take with you or read and relax on the comfortable sofa or study at the table. What is our Library’s mission? The purpose of the St John’s Lending Library is to serve the congregation through encouraging and promoting the reading of Christian books and materials. The library supplies a well-balanced selection of books and media for all ages and stages of Christian growth. In addition to enriching the spiritual and intellectual lives of our members, the library is also a resource center for other program ministries of the Church. What types of resources does our Library provide? The library is organized by categories or collections and are color-coded. These categories include Christian fiction, biography, children’s literature, inspirational writings and devotionals, parenting and family, marriage, evangelism and mission, Christian issues, histories, Bible studies, commentaries, reference and other resources. The library also subscribes to several periodicals for research or viewing by patrons who have some time to enjoy reading in the library. How can I check out a book or other resource? Very easily! Choose your materials then use the sign-out sheet provided on the small black desk. We ask that you return the materials within 30 days to the Returns bin under the desk. We use the Honor System!